Attacks On Sessions Could Be A Red Line For GOP Senators Jeff Sessions said he would "be glad to yield" if President Trump no longer wanted as him attorney general. Sen. Lindsey Graham warned Trump that there will be "holy hell to pay" if Sessions is fired. President Trump is famous for requiring the loyalty of his subordinates. But it's the loyalty of Republican senators — not to him but to one of their own — that is the heart of a simmering showdown between the White House and Congress. A growing number of GOP lawmakers appear to have had enough with what one has called the president's "public floggings" in recent days of Attorney General Jeff Sessions, a onetime senator from Alabama for served on Capitol Hill for two decades before joining the Trump administration. In an interview Thursday on Fox News' Tucker Carlson Tonight, Sessions said Trump's remarks had been "kind of hurtful." "I serve at the pleasure of the president," Sessions said, adding that if that should change, "I'll be glad to yield at any time." That Trump is trying to undermine Sessions seems clear — the question has been whether the president is trying to force the attorney general's resignation or simply laying the groundwork for firing him. If Sessions goes, some fear it could be a precursor to another firing — that of special counsel Robert Mueller, who is leading the Department of Justice investigation into the Trump campaign's possible ties to Russia and Russia's interference in the 2016 presidential race. Starting with a New York Times interview published barely a week ago, Trump has kept up a steady drumbeat against Sessions, calling him "weak" and "beleaguered," questioning his leadership of the Justice Department and demurring when asked what fate was in store for the attorney general. But mostly the president has expressed unhappiness that the attorney general recused himself from the Russia investigation which laid a stone in paving the way for Mueller's appointment. Given Sessions' own ties to the Trump campaign, the recusal is something that nearly everyone — save the president himself — agrees was necessary and proper. Graham's remarks follow a tweet from the chairman of the Senate Judiciary Committee, Sen. Chuck Grassley, telegraphing that a vacancy at the top of the Justice Department would go unfilled for months. In a statement, North Carolina's Sen. Thom Tillis called the attorney general "widely respected" and said his recusal "demonstrated good judgment," a sentiment echoed by Senate Majority Whip John Cornyn, of Texas, who told CNN that "Jeff Sessions did the right thing," by stepping aside from the DOJ Russia probe. Sen. Rob Portman of Ohio issued a statement calling Sessions an "honorable person" who "has the best interests of our country at heart." Alabama's Sen. Richard Shelby tweeted that he and his state offered "deep respect and unwavering support" for Sessions. Sen. Mike Lee of Utah said in committee that the attorney general is "someone I admire deeply." And, Pennsylvania Sen. Pat Toomey said "Sessions is a credit to the Department of Justice." U.S. Representative for Oklahoma's 4th congressional district, Tom Cole, who referred to the Trump attacks as "public floggings," complained that it isn't helpful "to throw your own people under the bus." 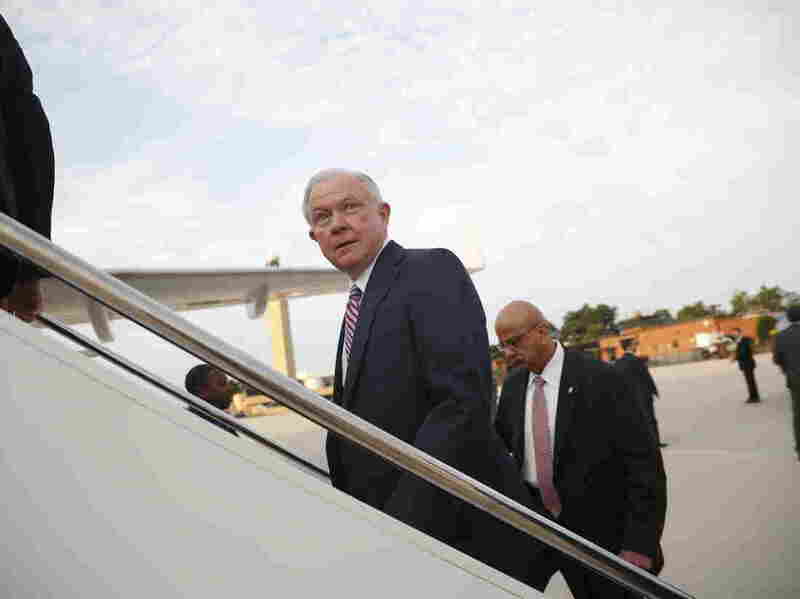 Meanwhile, Sessions set off Thursday for El Salvador to meet with law enforcement officials about strategies for combating the MS-13 gang. It's also, as NPR's Carrie Johnson points out, an opportunity for the attorney general to "[put] some distance between himself and the toxic environment in Washington." A previous version of this story incorrectly referred to Rep. Tom Cole of Oklahoma as a senator.